Make the pickling liquor by simmering 200 ml cider vinegar, 150 ml water, 4 Tbsp caster sugar, 3 Tbsp mustard seeds, 2 bay leaves and 1 clove of garlic. Simmer until the sugar is dissolved but do not boil, put in the fridge to cool. Use a peeler to peel strips down 2 large cucumbers so that half has rind and half doesn’t (mostly for appearance). Slice into 5 mm rounds, place in a colander over a bowl and sprinkle with a teaspoon of salt. 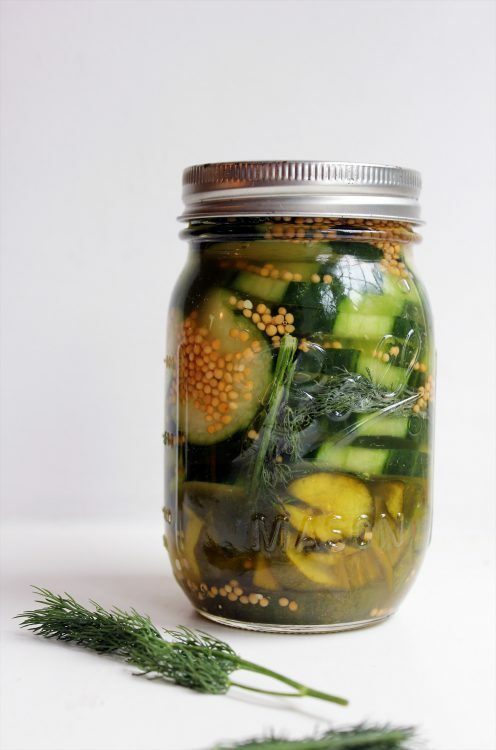 Allow to sit and release excess water for for 30 to 60 minutes while the pickling liquor cools. Tap the colander at the base and discard any excess water that has run off. Now, simply add the cucumbers, along with a few sprigs of dill, into a 1 litre kilner jar, pour over the liquor and seal. Ready to eat the next day.